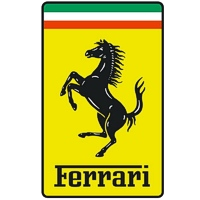 We are able to decode radios factory-fitted to Ferrari cars including the Ferrari Cascade and Mexico models made by Becker. Several Ferrari Satellite Navigation units can also be decoded including the Traffic Pro by Becker (BE 6100 series models). Blaupunkt, including differently coded USA models, unlocked from the serial number. After submitting the form, you will be forwarded to our payments page. Note that your request will not be actioned until payment is received. Our service is inexpensive but it is not free. We aim to give a good service to paying customers, with the assurance of our money-back guarantee: If we are not able to supply the factory-set code for your unit, we will explain why and offer some options wherever we can, and we promise to refund you, less just a small 45p transaction fee. You will need to pull the radio from the dashboard to read the numbers we need from its chassis - this will be on a printed label, engraved on the metal case, or both. 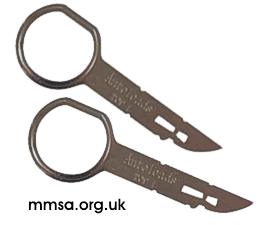 Extraction 'keys' (often of the type shown here) are required to remove the radio. Many of the Becker units fitted to Ferrari have horizontal slots along the lower edge into which the keys are inserted until they 'click' - this releases the internal clamps, allowing the unit to be withdrawn. Don't be tempted to try removing the radio another way or force it as you may damage the surrounding dashboard trim. The keys make it very easy - you can find them in motoring stores or online.